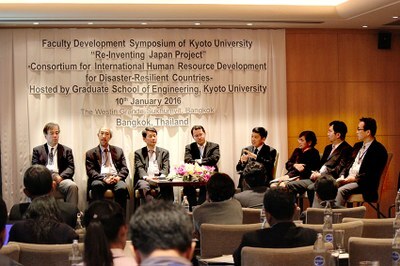 Home / News & Events / News / General Affairs Division / A faculty development (FD) symposium for Kyoto University’s Re-Inventing Japan Project “Consortium for International Human Resource Development for Disaster-Resilient Countries—Based on the Experiences of Disaster Recovery” was held on January 10, 2016. The FD symposium for FY2015 was held at the Westin Grande Sukhumvit, Bangkok in Bangkok, Thailand. This symposium was intended to facilitate the discussion and examination of problems and improvements in project execution in FY2015 from the viewpoints of faculty members, both from the ASEAN side and the Japanese side, on the basis of execution results from the Joint Educational Program conducted by Kyoto University and ASEAN Alliance Universities in order to make the best use of such results for project execution in FY2016 and onwards. We invited guests from the Kyoto University ASEAN Center, Graduate School of Agriculture, Kyoto University, and Center for Southeast Asian Studies, Kyoto University as well as from AUN/SEED-Net; a total of 46 faculty members participated in the symposium. Participants from the Japanese side included faculty members from the Graduate School of Engineering, Kyoto University, the Kyoto University Graduate School of Global Environmental Studies, and Kansai University. Those from the ASEAN side included faculty members from five alliance universities—the Asian Institute of Technology, Chulalongkorn University, Kasetsart University, Institut Teknologi Bandung, Vietnam National University, Hanoi; they were joined by faculty members from National Cheng Kung University. In the first part of the symposium, Prof. Hiroyasu Ohtsu of the Graduate School of Engineering, Kyoto University, who is the project director, gave the opening speech as the organizer. Following Prof. Ohtsu, Prof. Eiji Nawata, Vice Dean of the Graduate School of Agriculture, Kyoto University delivered a lecture entitled “AU-KU Student Mobility Program toward Human Security Development.” Subsequently, Prof. Mamoru Shibayama, Director of the Kyoto University ASEAN Center, and Prof. Yasuyuki Kono, Director of Center for Southeast Asian Studies, Kyoto University, gave a lecture entitled “Initiatives of the Kyoto University ASEAN Center.” Following these two professors, Associate Prof. Kakuya Matsushima gave a presentation on project execution results between 2011 and 2015. In the second part of the symposium, the activities of each of the ASEAN Alliance Universities and National Cheng Kung University in the project were reviewed. In the third section, Project Director Prof. Ohtsu explained plans for project execution in FY2016 and onwards. His explanation was followed by a panel discussion. In the panel discussion, a total of eight panelists from Kyoto University, ASEAN Alliance Universities, National Cheng Kung University, and Kansai University discussed subjects such as future directions for the project. They vigorously discussed future directions and exchanged opinions from their points of view. Lastly, Dr. Noppadol Phien-wej, of the Asian Institute of Technology, made a closing speech and the symposium was successfully completed. The FD symposium was a good opportunity to facilitate the continuance of student exchanges and the improvement of the Joint Educational Program.